For the first installment of Guest Blogger Month we have a piece written by my Hubby! As I mentioned yesterday, these stories can be about anything, including a favorite pair of boots. So long as it ties in with the LOVE theme. Well, this is a story about boots AND love even if the word ‘love’ isn’t typed among all the others. Yet you can still feel it! I found them in a box. In a storage unit in a cardboard box marked “Office Supplies.” The black leather uppers reached up to me out of the darkness of their resting place. 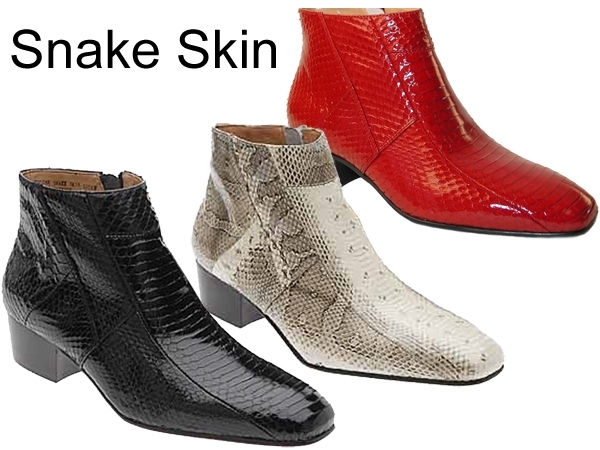 The snakeskin lowers remained hidden in the shadows made by the flaps of the box. I had long forgotten them, these boots of mine. My one and my only pair. I stared at them as I stood unable to move. A rush of memories came over me as if I were standing in a pool beneath a cascading waterfall. The memories felt clean and crisp and sparked an energy within me as good as any shot of adrenaline. They reminded me of a time many selves ago. I tried to think of the last time that I had worn them. It’s been at least six, maybe seven years. I think I met some friends for a drink and I wanted the feel, the swagger, that the boots provided me. The extra height of the heel didn’t hurt either. And I remember the pair of jeans that I always wore with them. The jeans were well worn, complete with holes, rips, tears, and frayed at the edges. 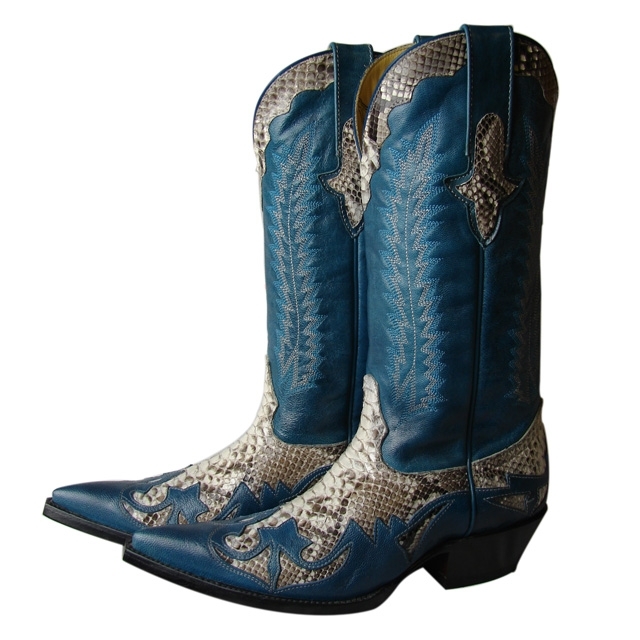 I liked the way the snakeskin peered out from beneath the denim. Those jeans ended up with the Salvation Army after one of my many moves. They say you should throw out any clothing that you haven’t worn in the past year. But I will never part with these boots. These boots are my reminder to myself of where I came from. I grew up on a small farm in Nebraska. I remember that I didn’t particularly like it at the time. The truth is, I despised it. There, I always felt that I was missing something in life. That somewhere else people were living the kind of life that I was meant to lead. Those big city people in the ads from the magazines, that’s the life that I dreamed of. I don’t remember much of high school. I guess I daydreamed my way through it. Even though my body was present and I did well in classes, my spirit was already in that other, better place. It was such an agricultural community that when the guys in the school turned the proper legal age, it was a sign of manhood to drive a vehicle, any vehicle, to school rather than be seen riding the bus with the other kids. The guys would drive practically anything that even hinted of independence. One guy I remember drove a tractor until he could afford a used truck of his own. But the independence award has to go to the kid that drove his father’s combine to school. One of those green, obtuse John Deere grain harvesters. Why drive a $250,000 machine to school? To avoid riding the bus. And also to posture as a man. Me? I rode the bus. My mother made sure of it. She was the bus driver. 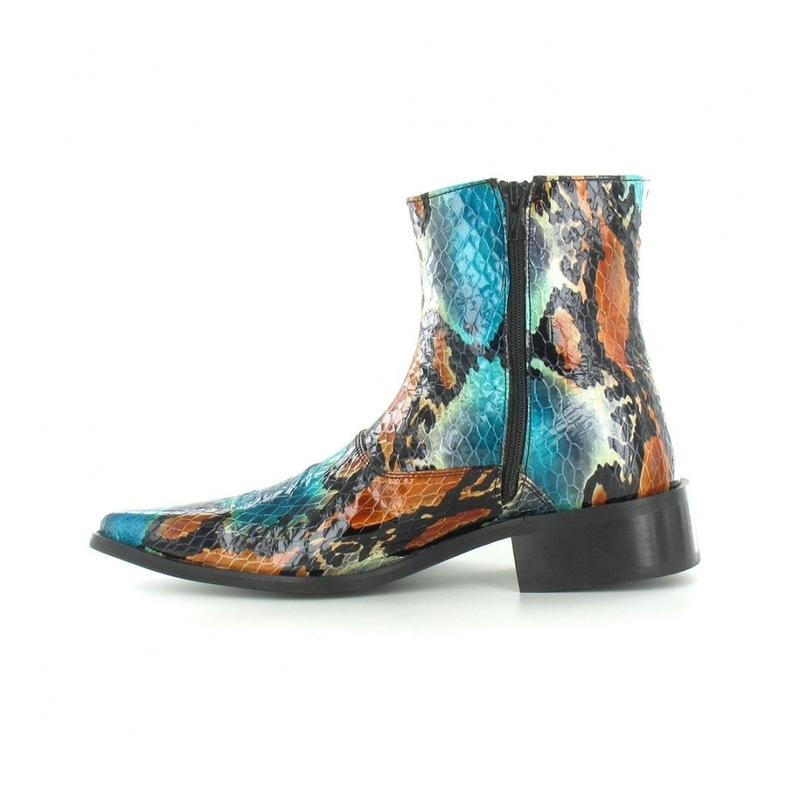 These boots are the only article of clothing that I own that even vaguely resembles my background. After college, I did move to one of those big cities that I yearned of in the magazines. I got a job in the big city and later a graduate degree in a bigger city. And it was only after several years away from the rural community that the appeal of the farm began to grow within me, like the soybeans, the wheat, and the milo that we planted each year. I began to understand why my Swedish father sought to reap the land of his father. I came home when I could, when work or school permitted. And one of those times when I was back home I decided to return to the big city with a piece of my roots. 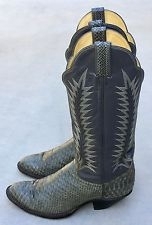 I bought my own pair of boots. It was not an impulsive decision. I did my research thoroughly. God, I had no idea how many varieties there were. How I pondered and struggled with the shapes, colors, leathers, skins, and of course, the prices. Five hours, four trips, and three stores worth of decisions. Ultimately I found a pair that I liked, a pair that I could call my own. Tony Lama’s. Anaconda. 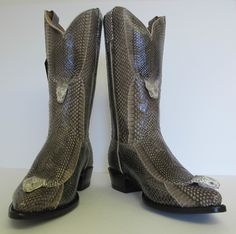 More cowboy than my father’s boots but I could wear these in the city and still pretend I was a farm boy. The storeowner warned me that snakeskin dries out over time and turns yellow. I didn’t care. I wanted my roots now. Of course, I bought the leather moisturizer that he sold me on, too. I remember my dad’s boots. They were brown leather and old and always dirty. They had a brass ring on the side which held the pieces of leather together. I always knew when he was home when those boots were on the garage steps leading to the back door. We never used the front door. Only salesmen and trouble used the front door. Whenever I saw his boots, I knew everything was going to be okay. Those boots protected us like a guardian angel. His boots were there to pull my car out of the ditch that I visited during an ice storm. They bore a familiar path in the snow to burn the trash in the middle of winter. They planted trees as a windbreak, dug holes for fence posts, and hunted pheasant in the fall. They delivered calves, buried the animals that didn’t survive the predators or the winters, and they mowed the lawn. They were there at two o’clock in the morning when that noise in the back of the house turned out to be a coyote and a raccoon doing the death dance. And they were a familiar sight poking out from beneath the engine of my first car, a true lemon. Physical problems vanished when those boots were around. His boots were manly boots. No snakeskin or alligator or ostrich for him. And definitely no moisturizer. His were functional. Work was done in his boots. My very first memory of his boots was when we shoveled four truckloads of manure to fertilize our new front yard. His boots seemed to energize him like spinach to Popeye. Shifting in cow excrement isn’t what Nike had in mind for the shoes that I wore that day. I’ll never part with these boots of mine. They’re my homage to my father, my life in the country, and to his land. He’s been gone for some time now and I still think of him often, wondering how he would handle a problem, or where he was in his life at my age. His boots probably disappeared in the sale of the farm after he died. I’m afraid to ask my mother what actually happened to them. If my boots can do one-tenth of the work his did, I’ll be a productive man. But then I’ll have to take them out of the box marked “Office Supplies” and actually wear them to find out. If you’d like to read more of Hubby’s writing, you can check out his blog by clicking here. Though it has been inactive since 2012, there are four years of exceptional content. Movie reviews, travel and posts about Ireland, my soul home! Nice thing is, his posts, unlike mine, are short. He is a man of few words. Yet when he speaks, or writes, it’s always something meaningful. I love him so much and am grateful that he allowed me to publish this story that I have always adored! P.S. For obvious reasons, I don’t have a photo of the infamous “Boots With Roots”. In fact, in the 9 1/2 years we have been married Hubby has never worn them. He bought them “BK” before Karen. Yet the story is so heartfelt and I can feel the love he has for them, and mostly for his dad and indeed his life on the farm. 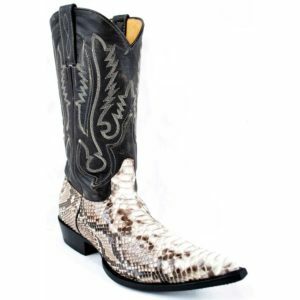 So I did a google search to find out what a pair of snakeskin boots look like. Here are a few options, which I am sure Hubby will laugh at when when he sees this post! But somehow, when I saw this pair, I kinda felt like maybe these were the ones! Oh yea and I can’t forget the moisturizer! I loved reading this, so beautiful. He’s a wonderful writer! I was drawn in immediately. This made me think of my Dad who grew up on a farm, moved away to raise his family, worked in large cities (including D.C & Atlanta) and has long since retired and moved back to his farm land. I think his plan the other day was to build a bridge across the branch. For some reason the moisturizer part didn’t surprise me! I adore Doug. Love the piece. What a beautiful post. Lovely to hear from hubby. And I never knew he had a blog! What a wonderfully eloquent piece of writing 🙂 I did laugh at the image of a combine arriving at school – I bet somewhere in Ireland you could see that too!! I love this! It’s amazing how clothing or otherwise ordinary objects can evoke so many memories for us.